I understand non-geeks may not know what to get their loved geek for the holidays. That’s why I am saving the galaxy from an unfortunate gifting and giving you this totally awesome Star Wars gift guide which I spent hours to make. So, enjoy and rest easy knowing you have some feels coming your way when your geek gets their gift. I hope someone who reads this is the person getting ME a Star Wars gift because I am so the geek in their life let me tell you. Be the winner, get your Star Wars loving geek something they really want (even if you don’t think it’s amazing they will). Darth Vader Star Wars MacBook Pro/ Air sticker decal vinyl skin design by Mac Tatt! Customize your Apple computer Laptop! Be the best ever gift giver in the history of gift giving when you get your loved one an epic Star Wars gift! In a galaxy not too far, far away this is really a cool prize. Beyond awesome. These are some of the nicest Star Wars gifts! Love the bags! I want everything that you posted!!!!! Star Wars is the best!!!! The Star Wars Lego sets are our favorites. I LOVE the Loungefly Star Wars Tattoo Flash Print Faux Wallet. I love this! Love the Star Wars R2-D2 USB Car Charger the most! Would be something useful and cute! I love the Loungefly Star Wars R2D2 Blue/White/Silver Patent Dome Bag the most! I think many items on this list would be great for several Star Wars fans in my family. We have a few already, but that toaster (and tumbler) would make me happy! I would love to win the luggage, but the problem would be who gets to claim it as theirs! What a great round up of gifts!!!! (Thanks! Everything look so cool, I’ll take one of each. I LOVE the Sphero BB-8 App-Enabled Droid! So many awesome items – my fav is Darth Vader Toaster! I love it all, but the R2-D2 luggage is AWESOME! I like all the ideas, but my favorite is the R2D2 LUGGAGE. I like the Star Wars R2D2 Stud Earrings Silver 3D Stainless Steel Detailed. Lots of other fun stuff, too. I love the American Tourister Star Wars Luggage Sets the best. I love the R2-D2 luggage…and so would my son! He’s a HUGE Star Wars fan! I love the Start Wars tervis tumbler! I like the Darth Vader waffle maker. I love the R2D2 headphones! These are some of the nicest Star Wars gifts! I love this list but I surprised the original R2D2 droid robot didn’t make your list. 🙁 I do love the r2 purse, that is a new one that I have not seen at all and need! My husband would love one of those watches! I totally think it’s a sophisticated way to represent! I like Star Wars myself but my grandson (he will be 22 in Jan.) is into anything Star Wars. Bought so much but he would love the watch. May get that for him for Christmas. All these gifts are AMAZING!!!!! My family and I LOVE Star Wars. These gifts are GREAT!!!!! I’d love to have the Darth Vader Waffle Maker–because the kids would get such a kick out of it! All of it rocks….me and my nephew would go nuts for this. This is a fantastic list! I would love the luggage because – I need luggage! My favorite is the Star Wars luggage. My grandkids would love to own this. I love the R2-D2 luggage! My son would go NUTS for it! I want that BB8 bag! I love it. I can’t pick! I think the luggage caught my eye. But maybe the R2-D2 purse?! I love anything R2D2 and those purses are pretty sweet! omg. the self stirring mug and toaster. Love. I love the BB-8 by Sphero! I saw the luggage at D23. So cute! I want the handbags. Love these gift ideas for my grandson! LEGO Kids’ 9002113 Star Wars Darth Vader Mini-Figure Alarm Clock looks like something he’d go crazy for! The Loungefly Star Wars R2D2 Blue/White/Silver Patent Dome Bag is so much fun! The Loungefly Star Wars R2D2 Blue/White/Silver Patent Dome Bag is so rad! The Star Wars Chewbacca Big Face With Santa Hat Adult Brown Ugly Christmas Sweater is sweet! If I owned those R2D2 suitcases, I would actually travel! Love the Star Wars Bags!! I love the yoda sweater! so cute! I want everything Star Wars…but I really love the R2-D2 bag from LoungeFly! I like the SMS Audio Street by 50 Star Wars 2nd Edition Headphones (R2-D2) and share it on twitter. I love the RD-D2 bag from Loungefly. Mix your drink with the force is so clever. What an awesome gift guide! I can’t pick one favorite but in the spirit of the holidays I love the Yoda ugly Xmas sweater and the ugly sweater leggings. Love them all, but my favorite is Loungefly Star Wars BB8 Dome Bag Top Handle Bag. Those couple rings…oh goodness. I need them! 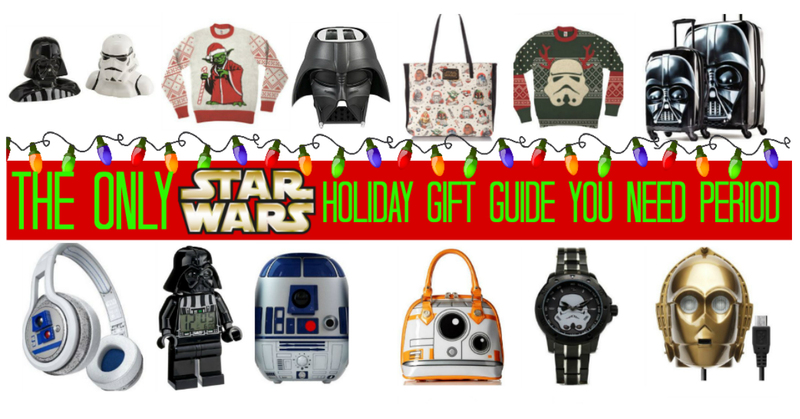 There are so many great Star Wars gift ideas for everyone listed here. My husband would love the chopsticks. I know this sounds CRAZEE, but this STAR WATS LOVER Wants EVERYTHING SHOWN in your Star Wars Gift Guide: the clothes, jewelry, Chewbacca hat, R2D2/ Darth Vader luggage, and (big sigh).. EVERYTHING else! The Loungefly Star Wars BB8 Dome Bag Top Handle Bag would be an awesome change from my usual ‘bleh’ bags. Definitely on my wishlist! The alarm clocks are just so cute my daughter would really like the LEGO Star Wars Stormtrooper Figurine Alarm Clock. I’m a big fan of star wars. So I enjoy all of it! I think the luggage is pretty unique. I absolutely love the collection. The luggage and handbag are my top two of wishes this year! You nailed it! Love the suitcases. R2-D2 luggage set! ! ! I want them all but I really like the Star Wars R2D2 Capacity Ultrasonic Cool Mist Humidifier. We’re huge Star Wars fans. I love the luggage set. It’s so cute! so many cute items! Love the Star Wars Ugly Christmas Pattern Red Leggings and the wallet for myself, the ugly Darth sweater for hubby and the kiddos could sure use the darth alarm!!! Great items!!! Love the cookie jar and chopsticks. The toaster and alarm clock is great! I like all of it. The Loungefly Star Wars BB8 Dome Bag Top Handle Bag is my favorite. I really like the Loungefly Star Wars Tattoo Flash Print Faux Tote Bag, Multi, One Size. Its great! I like the Star Wars Jewelry Unisex 3D Storm Trooper Stainless Steel Stud Earrings. They are kind of neat looking. I bought my nephew the headphones for Christmas! Love Star Wars I do need very much these things!!! My son would love the Star Wars Lego sets. The Lego Alarm clocks are fun! My son has (and loves) that LEGO Darth Vader clock! This is so AMAZING I can’t pick which product I want, but the Vader/Stormtrooper Salt & Pepper shakers are calling my name. Thanks for the giveaway too. my kiddo loves the Star Wars Lego sets. The holiday sweaters are hilarious! Love the Star Wars hand bags and the chopsticks looks cute! Love the Star Wars PS4! oh my gosh all this stuff is so cool! My brother would go crazy too! The Star wars watches looks pretty cool. BB-8 is a neat toy.